REUSE AND REDUCE WASTE - The better alternative to single-use plastic bags. Bumkins Sandwich Bags and Snack Bags single ply construction means no worrying about icky stuff growing between layers of fabric. Without a cotton layer, this means stains and smells don't stick to your bag, and a smooth zipper closure doesn't hold crumbs. Easy to wash - use over and over again! Never run out of plastic bags! LAB TESTED FOOD SAFE - At Bumkins, we take pride in our rigorous product testing to ensure you have the safest possible products. Our sandwich and snack bags are BPA-free, PVC-free, vinyl-free, phthalate-free and lead-free. LOTS OF USES - Not just for food. Sandwich bags make excellent organizers for storage and travel! Stash inside your purse, diaper bag, or travel bag. Great for pacifiers, cosmetics, cash, electronics, and more. The better alternative to single-use plastic bags, our reusable sandwich and snack bags are made from the same easy-wipe waterproof fabric as Bumkins award-winning SuperBib. A smooth zipper closure doesn't hold crumbs and single-ply construction means no worrying about icky stuff growing between layers of fabric. 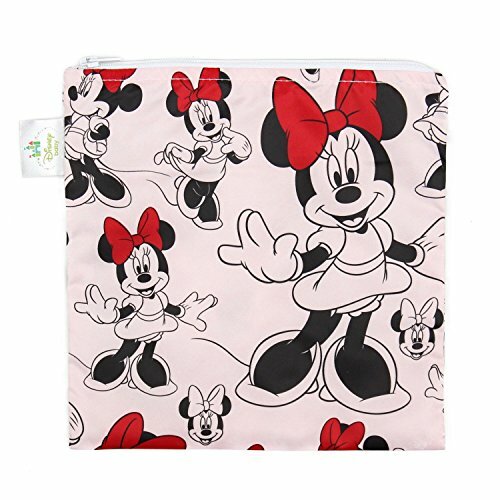 Great for food and fun, sandwich bags help organize lunches, toys, electronics and more. Also available in a smaller snack size, 2-pack. Machine washable and dishwasher-safe (top rack) for easy cleaning. Food safe, BPA-free, PVC-free, vinyl-free, phthalate-free and lead-free. Measures 7"x7”. Designed in Arizona, responsibly made in China.